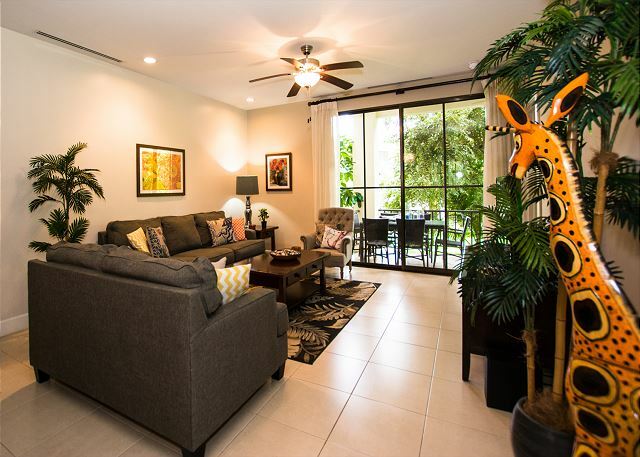 Pacifico L610 - Modern 3 Bedroom and 2 bath, very spacious end unit. 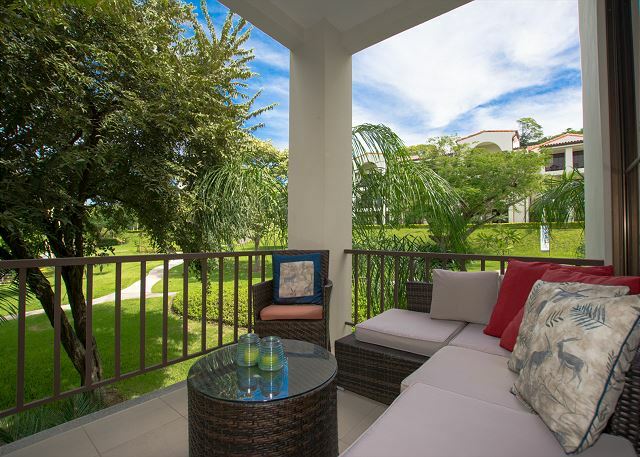 Large terrace to enjoy the pool and garden view. There is 3 pools in the complex, two of them are with the lazy river pool style. This condo has an open concept. 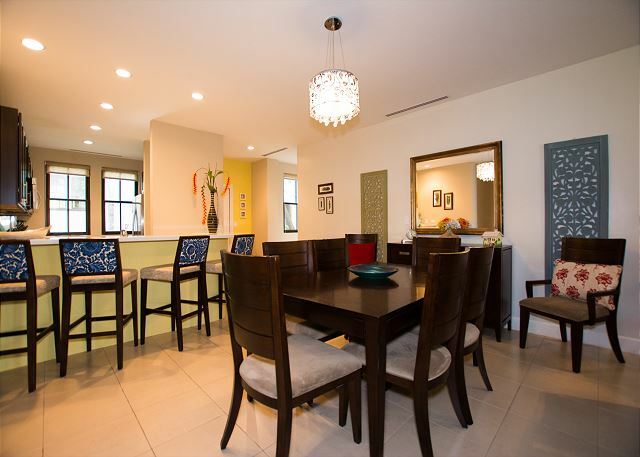 Easy access from kitchen to dinning area. Living Room with confortable sitting area and flat screen TV in front of it. 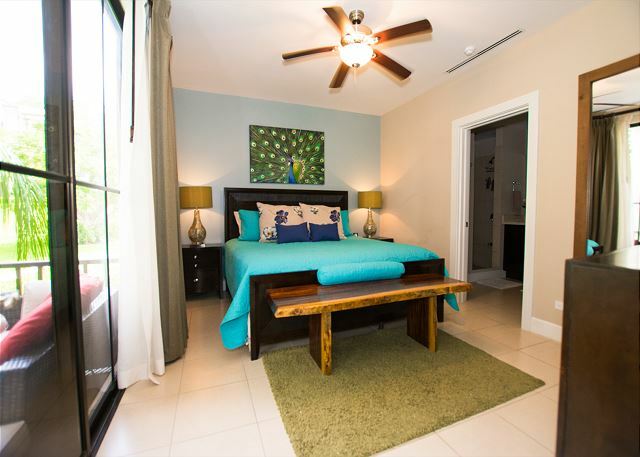 The master bedroom feature a king bed, blackouts, private bathroom and TV. 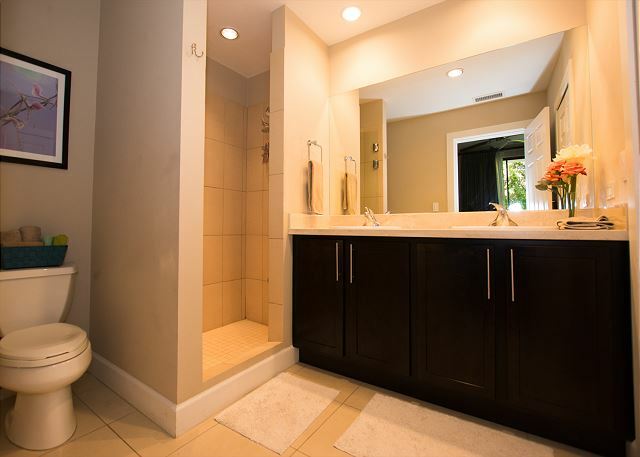 Guest bathroom with walking shower. 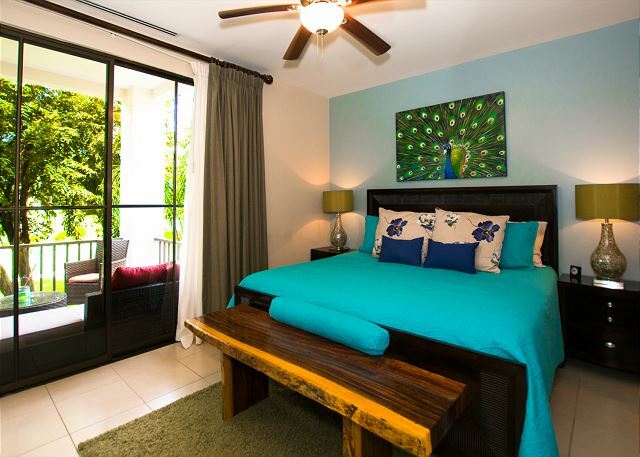 Our beautiful condo is an end unit on the second floor and will be your vacation retreat and get away for those with exquisite taste. 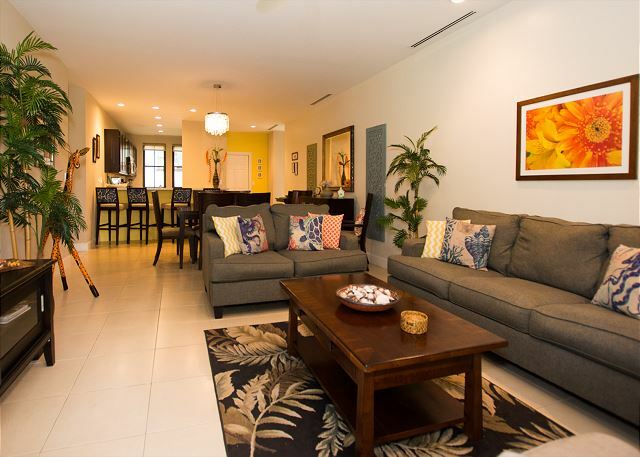 The décor in the condo has been carefully selected for luxury living and comfort in mind. 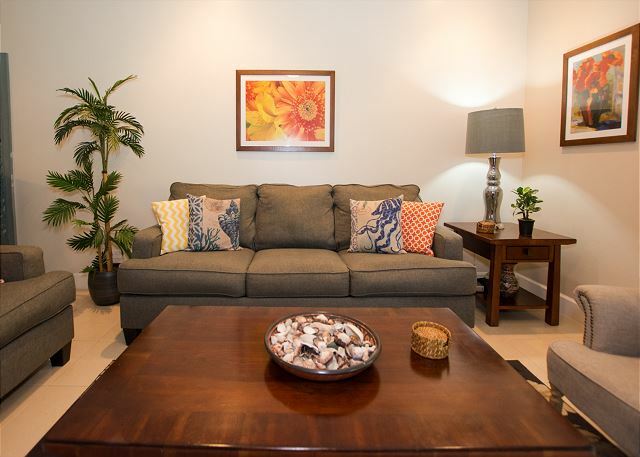 The condo is extremely spacious and is fully equipped including large flat screen TV, cable, and wireless internet. 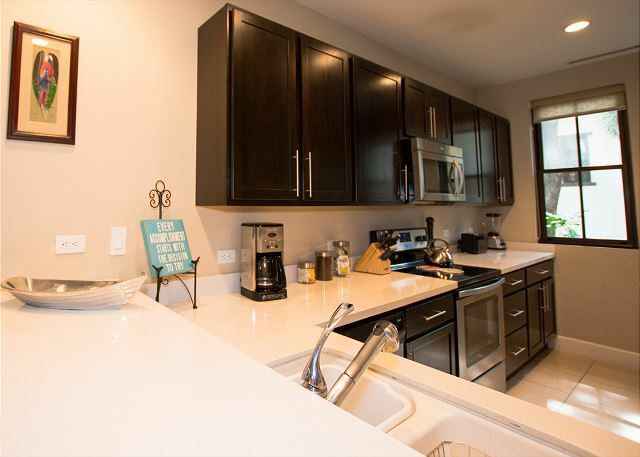 Enjoy preparing your meals in the gourmet kitchen which has everything you will require during your stay, quartz counters, top-of-the-line appliances. If you enjoy cooking, wonderful, there is a lovely grocery store at the entrance of the property, which has everything you could possible need…..if you rather not cook, not a problem, there are many restaurants to meet any of your specific tastes. 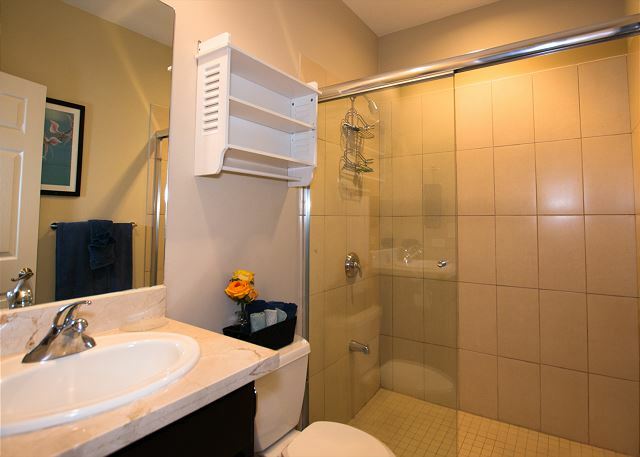 The condo has 3 bedrooms and 2 bathrooms, 1 king en suite bedroom, the 2nd bedroom has a queen bed and the 3rd bedroom has two twin/single beds. Pacifico Resort is in the heart of Playas del Coco and just a five-minute walk to restaurants, bars, supermarket, stores and the beach. It is located only 25 minutes from Liberia airport. 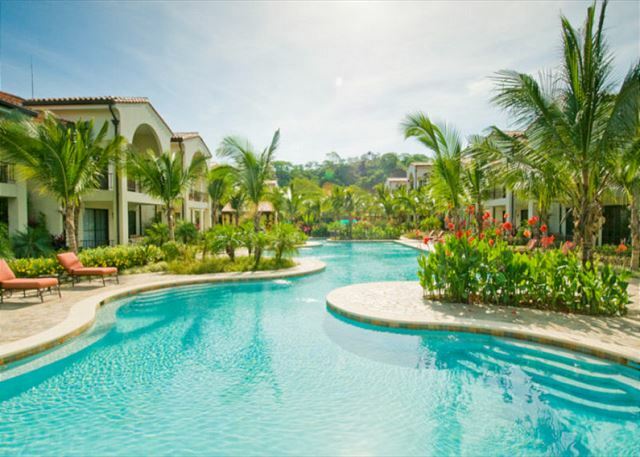 As a guest of Pacifico, temporary membership to the exclusive Pacifico Beach Club is available during your stay for an additional $70 a week per person (per condo). The Beach Club is located 1 mile from the resort and free shuttle is provided every day. 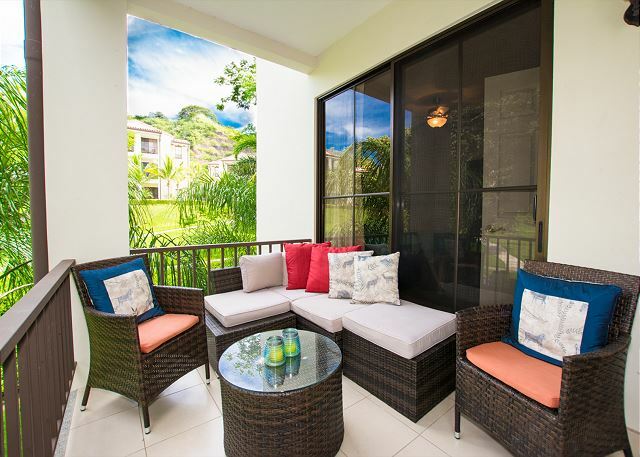 Sit back and spend a little time lounging on the patio while the world is quiet and sipping your hot cup of coffee. The mornings are beautiful and peaceful and just maybe you will not only hear the birds but you will have a great view of them. 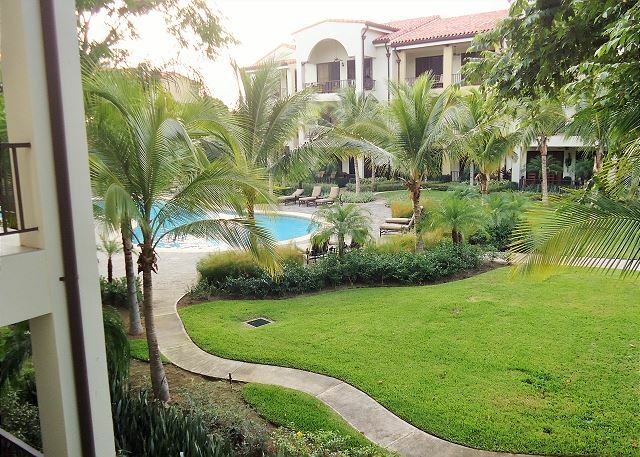 Milagro is available to help with all your needs during your stay in L610, Playa del Coco. Pura Vida. 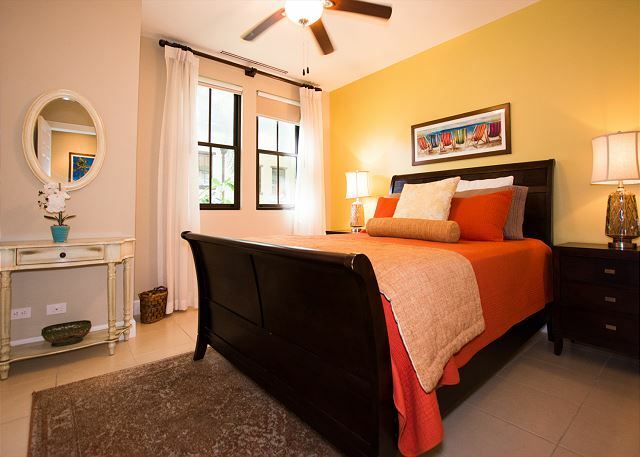 We found Milagro to be very responsive before and during our stay...very helpful. We rented a three bedroom condo for our extended winter retreat. The unit was comfortable and well equipped. Playa Coco is convenient and Pacifico is lovely. Milagro Isabel wonderful property manager and goes out of their way to make your stay enjoyable. De principio a fin, la ubicación (cercanía con muchas playas, el pueblo pesquero de Playas del Coco, supermercados, gasolinera, restaurantes, naturaleza y el disfrute de varias piscinas de gran tamaño para todos los gustos y ni que decir de las vistas y los bien cuidados jardines. La propiedad es muy funcional, segura y poco ruido en los alrededores. We just got back from 10 days in Playa del Coco and had an amazing time. The condo is perfect and had everything we needed. No complaints at all! The pools were amazing and the grounds were well kept and close to where everything is except the beach. We rented a gas golf cart and easily got around to the other local beaches. My only complaint is how expensive things were in the area especially the resultant a and the groceries. The actual beach in Coco is not very nice but playa hermosa was fun for playing on the waves and playa octal is teally pretty too! Great location and perfect for our needs .Very spacious and decorated nicely.Had everything we needed including a bbq pit Nice pools w snack bar and drinks Perfect! The unit has a great location on the property. It is very close to all of the pools and has a nice spacious balcony overlooking one of the pools. Plenty of shade on the balcony as well. The inside of the unit is quite spacious and comfortable as well. The staff were helpful and responsive to requests. There aren't any phones for use on the property so plan ahead if you need to stay in touch. Overall we were more than satisfied with the unit. This was our 2nd trip to Pacifico in Costa Rica. 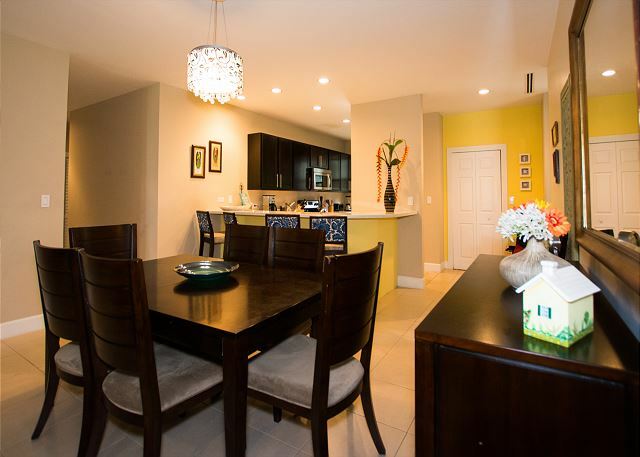 This 3 bedroom condo was great! 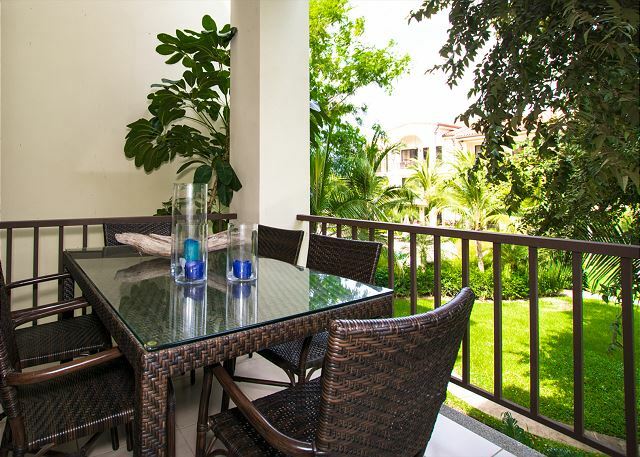 The gated Pacifico property is pristine with 3 pools, poolside grill and bar and a gourmet supermarket on the property. As a renter at Pacifico you can use the beach club (off premises) which is very beautiful but the prices went up significantly since last year. Milagro suggested Cafe de Playa a couple of doors down as a less expensive alternative. We had dinner there one night and loved it! 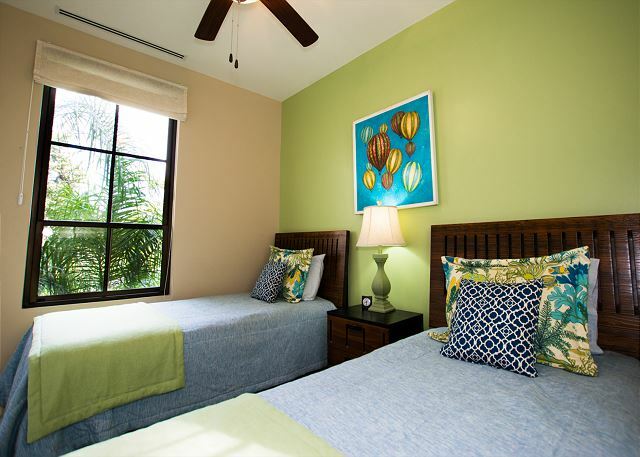 We booked with Milagro Management and they were very helpful every step of the way. Frazer booked our car, made dinner reservations for us and helped in any way he could. Carolina in the office at Milagro was very helpful as well. 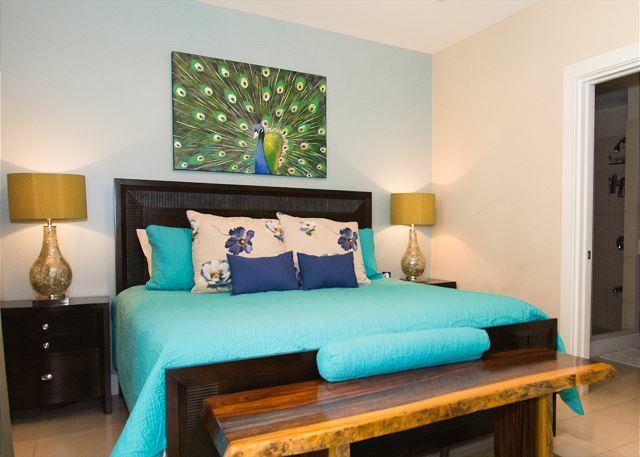 Playa de Coco has everything you need in walking distance, many restaurants to choose from, shopping, beach, etc. We ziplined at Diamonte, and rented ATVs at Conchal beach (a must see!). Unfortunately we were unable to sail on the catamarran (Marlin del Ray) because it was too windy. I highly recommend visiting Costa Rica and staying in Pacifico! Our stay at Pacifico was everything that you would hope for. The unit itself was nicely appointed and had everything that we needed, and the property was beautiful and nicely landscaped. We enjoyed it all very much and would definitely stay here again. We had a wonderful time, the location was perfect and the property was wonderful. You don't really need a car if you are staying in town but we did rent a golf cart which was perfect. Grocery store is right outside of the property, made it very convenient! The drivers to and from the airport were so nice and full of great information. Great experience and definitely a return customer. The condo was perfectly decorated and very comfortable. We loved it!! Best condo I have ever rented! We were collected at the airport and delivered to a little piece of heaven- L610. 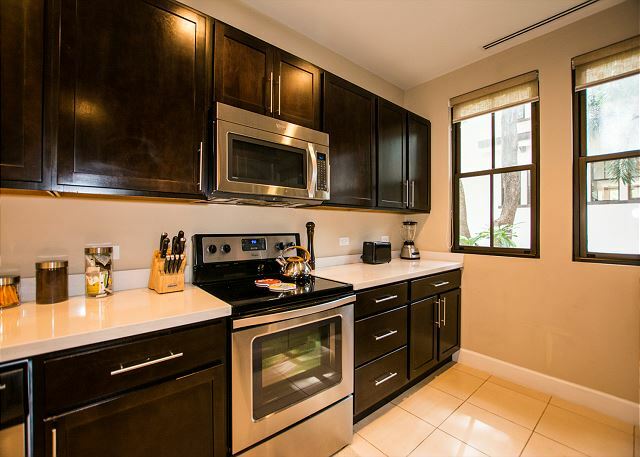 This condo is newly decorated and is appointed with everything one could want. The beds are very comfortable and the water pressure is amazing! The porch comfortably seats 6-8 with a peek of the pool and a large tree in the grounds giving porch privacy . I liked that it was an end unit and therefore it felt very private. Down one flight of stairs and you are at the pool (one of three. )Great poolside service for drinks and food. One of the best things that one may not think about is the weight of the curtains.. the sun comes up at 5am. 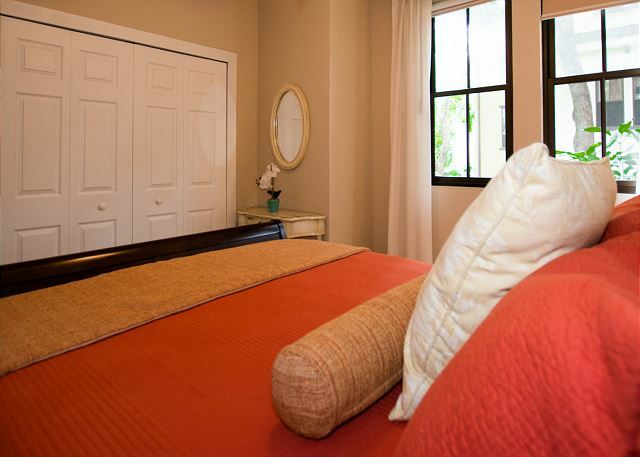 The thick curtains and blinds keeps the sun out while you have a sleep in. The couches are almost too comfortable - many afternoons with our Kindles and napping on them. This place is just the best condo ever! 3 bedroom condo was very spacious, more so for us as we didn't use the 3rd bedroom as part of the rental. Very clean and new and close to the pools which were great. only disappointing thing was the lack of use of a barbecue because Pacifico resort has not put and may not a central barbecue station in next to the pool. They opted to put a pool grill and bar there instead of providing barbecues for their clients like most resorts I have been at worldwide. Propane barbecues were outlawed on the units balconies which was an expense the owners lost and electric barbecues are expensive to but there. Milagro Mgt was very good at providing additional glassware which is needed in a unit that could hold 8 people. Food and boose is expensive compared to USA and Canadian vacation costs but you can save by finding the local vendors like fish & fruit.Mangoes, melons and pineapples are to die for down there. Delicious.Being Canadian it is frustrating that they charge in US dollars for tours which was over a 30% premium on the exchange for us, but the tour costs can be bargained down in some cases.Departure Head tax at airport is a rip off . $28 US I think. I thought they were getting rid of that. Car rentals are also very expensive because of the manadatory third party liability which doubles your car rental cost and is often not shown when you book on line before getting there.We took our car back a week early because we didn't use it enough to justify the costs. Taxis are cheap and the resort is within walking distance to groceries and restaurants. The Beach Club on the bay needs to have better shuttle service as the last shuttle leaves at 4pm and it is open till 6pm Very frustrating to have to leave right when happy hour starts at 4pm on saturday. Great pool and spot on the beach for $50 EXTRA for a week. Overall great place to stay. It was great staying once again at a Milagro Rental Property. The condo was in great condition, brand new, great beds and furniture. As good or better than home.